Many people criticize the Japan Restoration Party for its alliance with Ishihara Shintaro, but that’s only because they had clearly stated their policies, and the changes to those policies were conspicuous. Other than maintaining the status quo, the Liberal Democratic Party had no policies, so they didn’t even bother with incongruous alliances. The Democratic Party started falling apart when they clumsily started to declare their own policies. 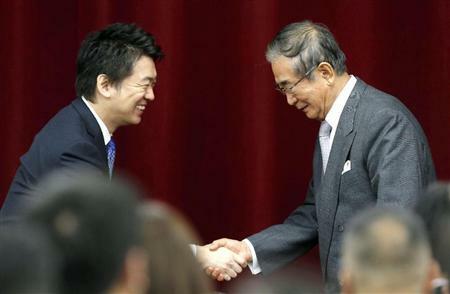 It might be that the “father-son tie” the Japan Restoration Party has formed will be the one to last longer. Mr. Ishihara recommends overlooking the small differences in favor of the greater areas of agreement, but these aren’t small differences. His ideas on such issues as nuclear power are all over the place…(The idea that he would create a third force in Japanese politics) is an irrational argument that completely disregards policy. The Japan Restoration Party is expected to win a substantial number of seats in the general election that will be held before long. It is possible they will work with the Liberal Democratic Party to take control of government. If that happens, the voices of the extreme right will grow that much louder. Even if the Democratic Party were to retain control, the previous absurdities will become an established fact. 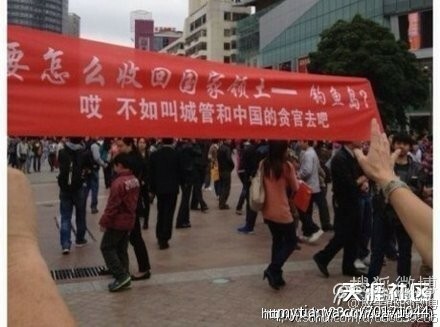 It is likely there will be no withdrawal, even if more absurdities emerge. The territorial dispute with China is a product of the extreme right. As soon as Tokyo Metro District Gov. 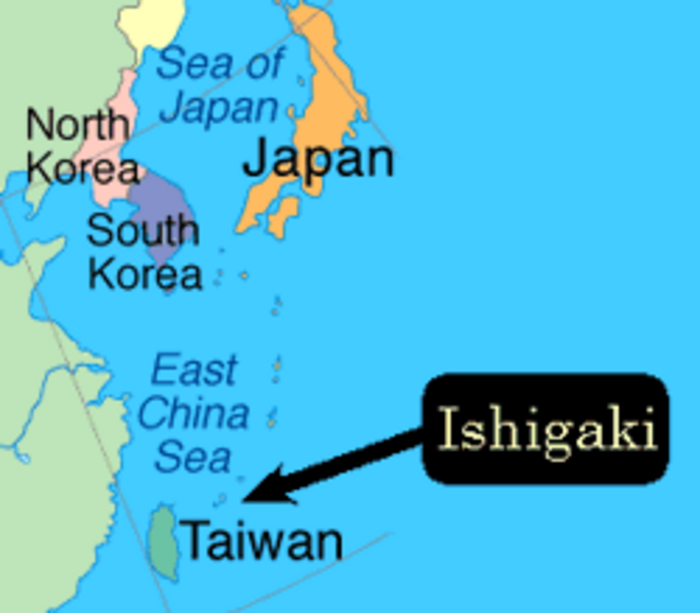 Ishihara announced his plan to purchase the islets, the Japanese government produced JPY 250 million as if they had been waiting for it and nationalized the territory. The state and far right politicians are now a group of plotters up to no good. We ask the 120 million people of Japan: Will you only watch as Japan brings the extreme right to the forefront and you plunge to the level of a third-rate country? Will you forever miss the opportunity that the victims have allowed you? Bonus points to anyone who can find the Takeshima islets in the logo. I’ve been watching CCTV all morning, and it’s easy to see that the most famous Japanese person in China is Ishihara Shintaro. Sounds as if they have more on their mind than some Japanese islands, doesn’t it? Meanwhile, the guessing game has started, especially in Japan: Who started it? Here’s the handicapping for the three choices. He’s the type and he has the authority, but he doesn’t have much of a motive. He has the authority and the motive (ingratiating himself with the military), but is he the type? They’re the type and they have the motive, but do they have the authority to pull it off? One of these days, we might even find out. “In mid-April this year, Tokyo Metro District Gov. Ishihara Shintaro of all people went to the United States and declared that Tokyo would purchase the islets. Everyone knew this was a confrontational act. By soliciting money from the public, he expanded the contradiction to the level of the citizens. He intentionally created a crisis between the people of both countries. Mr. Cheng seems to forget who started the confrontation in 2010, why Mr. Ishihara took that step, and that governments in free market countries are limited in their ability to stop private-sector real estate transactions, but then he has a job to do. One more quick one: Hit this link to see 11 excellent photos of the Chinese fishing fleet (and patrol boats) headed to the East China Sea. Many will surely head for the Senkakus. The Nikkei Shimbun yesterday estimated the number at about 10,000. It’s essential viewing for more reasons than one. “The Chinese infrastructure, Beijing Airport, Pudong Airport, the main railway lines, power plants, and steel mills were all built with Japanese ODA using long-term, low-interest loans. As President Hu Jintao said when he visited Japan, ‘China’s modernization would not have been possible without Japanese ODA'”. What the restrictions of the medium prevent him from saying is that Japanese ODA was, in part, de facto war reparations. When Sino-Japanese relations were restored 40 years ago this year, the Chinese chose not to ask for reparations in the spirit of letting bygones be bygones and looking to the future. Gosh, an update already: Here’s a headline from an editorial in the People’s Daily today. They conclude by asking if Japan is ready to have the 10 lost years of the economy turn into 20. A coalition government would be the best (way) to prevent an election being fought on the issues of a consumption tax increase and the restart of the nuclear power plants. THE biweekly Sapio interviewed Your Party head Watanabe Yoshimi about his views on potential alliances between his party, the successful regional parties, and a new party that might be formed by Tokyo Metro Gov. Ishihara Shintaro. The premise of the interview was that the ruling Democratic Party and the opposition Liberal Democrats and New Komeito have formed a de facto coalition to pass the consumption tax increase. The magazine referred to this coalition as Tax Increase Assistance Association, a deliberate play on words using some of the kanji from the name of the Imperial Rule Assistance Association, a body formed in 1940 by disbanding the political parties and merging them into one central organization with the bureaucracy and military leadership. The interview appeared in the 18 July edition. Q: Tokyo Metro District Governor Ishihara Shintaro is showing signs of responding to the One Osaka group by forming a new political party. Will Your Party, One Osaka, and a new Ishihara party create a third force in Japanese politics? Watanabe: I’ll be paying attention to the policies of a new Ishihara party. Gov. Ishihara’s true values have been those of a right-leaning conservative politician for many years. In contrast, while Mr. Hashimoto does support the group singing of the national anthem, he is not necessarily a politician that leans to the right. I have the impression that his thoughts and beliefs are very restrained. You can get an idea of his thinking by looking at the instructors in foreign policy and security at his political juku, based on One Osaka’s eight statements of principle. They selected people who aren’t hawks, such as Okamoto Yukio and Kitaoka Shin’ichi. I wonder how far Mr. Hashimoto and Mr. Ishihara would be able to work together on foreign policy and security. To begin with, the stance of One Osaka is opposition to the consumption tax increase and their proposal that the tax should be made a revenue source for local government. I have not heard Mr. Ishihara express an opinion like that. Q: People are saying that Sonoda Hiroyuki, the Sunrise Japan party secretary general and the driving force behind a new Ishihara party, has called on One Osaka and Your Party to form an alliance. Watanabe: The next election will certainly be fought on the issues of the tax increase and the restart of the nuclear power plants. We’ve said that there are things to do before raising taxes, and things we must do before restarting the plants. Sunrise Japan probably supports the restart of the plants, and thinks the tax increase is necessary, putting them close to the LDP. Even if Mr. Ishihara created a new party with people of that sort and became its head, it wouldn’t create an opposing force to the LDP and DPJ. Q: You could not create a third force with a new Ishihara party? Q: Both Your Party and One Osaka promote the deregulation of power generation. You’re in agreement with Gov. Ishihara on that point. Watanabe: The deregulation of power generation is part of our agenda. We think Tokyo Electric Power should be liquidated, and the assets that can be sold should be sold off on the premise that the generation and transmission operations will be separated. Discussions might move forward if he goes so far as to make that argument for complete deregulation. Mr. Ishihara says he is going to launch a new party. I’m at the stage now where I can’t make a judgement until the party has been formed and I hear what policies they will pursue. Further, the extremely strong ties in the Ishihara family are very well known. His children respect their father, and the father is concerned about his sons. Mr. Ishihara’s eldest son is the secretary-general of the Liberal Democratic Party, and his third son was defeated in an election running as an LDP candidate. Considering that, I wonder if he would really launch a new party that would interfere with his sons. If the intent of the new party is to be a supplementary force to the LDP, then we wouldn’t be able to work with them. It is necessary to take the measure of the new Ishihara party policies and their political course. Q: But One Osaka has invited Mr. Ishihara to lecture at their political juku, and Mr. Hashimoto and other senior party members are holding discussions with former Prime Minister Abe Shinzo of the LDP. Aren’t One Osaka and the LDP coming closer together? Watanabe: Perhaps the thinking of the people at One Osaka is that if none of their senior members, such as Mayor Hashimoto or Osaka Gov. Matsui, enter national politics, the only people from One Osaka who will be in national politics are first term council members. One might imagine that they could have exchanged opinions with Mr. Ishihara and Mr. Abe about who would be suitable to play a leadership role in uniting the Diet members. If that is the case, it would be a problem if all of a sudden, their leader in the Diet was still an LDP member. But Mr. Ishihara seems to be thinking of using Sunrise Japan as the core of his new party, and Mr. Abe does not seem to be interested in leaving the LDP. In that regard, I think One Osaka’s strategy and organization will now begin to take shape. What’s important is that the DPJ and the LDP have gotten on board the current governance mechanism of centralized authority led by the bureaucracy. Both Your Party and One Osaka say that governance mechanism should be changed. We would be finished in the instant we joined hands with an existing party. That’s why we will not become a supplementary force to an existing party. They’ve got the ABCs down, now to work it out as far as the XYZs. Uehara Hiromi playing piano is as good an image as any of the political ferment in Japan today below the level of the National Political Establishment. Watch and listen to her bang her right fist into the keyboard at about the 2.30 mark, slip in a bit of salsa, and then go roaring off in several other directions. The Foreign Service Institute (FSI) is the Federal Government’s primary training institution for officers and support personnel of the U.S. foreign affairs community, preparing American diplomats and other professionals to advance U.S. foreign affairs interests overseas and in Washington. At the George P. Shultz National Foreign Affairs Training Center, the FSI provides more than 600 courses—including some 70 foreign languages—to more than 100,000 enrollees a year from the State Department and more than 40 other government agencies and the military service branches. The Foreign Service Training Institute takes charge of providing training programs that can be classified into three main categories: Training for Newly-recruited Foreign Ministry Officials, Training for Overseas Pre-Postings, and Training for Mid-career Personnel. China’s Foreign Ministry slammed Tokyo Gov. Shintaro Ishihara on Friday for suggesting that if a giant panda on loan from China gives birth at a Tokyo zoo, the cub should be named after the Senkaku Islands, a cluster of Japan-controlled isles in the East China Sea also claimed by Beijing… Ishihara said that if a baby panda is born, it should be named “Sen Sen” or “Kaku Kaku,” referring to a recent announcement by Ueno Zoo that the female giant panda Shin Shin has shown signs of pregnancy. “Ishihara’s scheme to undermine China-Japan relations is a clumsy performance. It will only tarnish the image of Japan and Tokyo,” Foreign Ministry spokesman Hong Lei said at a news conference. “No matter what names the Japanese side gives, it cannot change the fact that the two pandas belong to China,” Hong said. How did we ever live without foreign ministry spokesmen? “Likewise, what names Japan gives to the Diaoyu Island and the adjacent isles, it cannot change the fact that these islands belong to China,” he said. Shame on Kyodo for calling the Senkakus “Japan-controlled”, by the way. They’re Japanese territory. The Chinese continually recognized Japanese sovereignty and were never interested in controlling them until mineral deposits were found on sea beds nearby. Japan and South Korea on Friday postponed signing their first-ever military agreement, aimed at sharing classified information, due to a last-minute request from South Korea amid concern about a public backlash over the strengthening of cooperation with its former colonial power. The postponement, announced around 20 minutes before the planned signing ceremony in Tokyo at 4 p.m., reflects how difficult it is for the two countries to work together amid South Korea’s lingering resentment over Japan’s 1910-1945 colonization of the Korean Peninsula. Shame on Kyodo again. It’s not difficult at all for Japan to work with South Korea — when the latter demonstrates adult behavior. Cancelling a ceremony to sign a treaty 20 minutes before it is to be held because those cancelling it are incapable of explaining the advantages to the public six months before a national election is not adult behavior. It’s cutting off your nose to spite your face. …which, the world knows, the Japanese would employ to start their secret planning for an amphibious assault on Busan. South Korea needs the pact “because we have to use Japan’s intelligence assets, including its spy satellites and high-end surveillance aircraft,” said the South Korean official quoted by Yonhap. “It is an undeniable fact that the existence of Japan is important for our national security,” the official said, citing the presence of U.S. forces in Japan, as well as in South Korea. The military intelligence pact is also needed to cope with China’s rise, the official told Yonhap. Then again, the Japanese factor into their thinking the millennia-old Korean tendency for Chinese appeasement. Japan has so far reached similar agreements only with the United States, France and the North Atlantic Treaty Organization. They fail to mention that South Korea has similar agreements with 24 countries, including Russia, and the government is planning to discuss an agreement with China. But it’s the cloven-hooved ilbonnom who can’t be trusted. The two countries dropped the word “military” from the name of the agreement as some Koreans still hold bitter memories of Japan’s colonial rule. …99% of whom aren’t old enough to remember Japan’s “colonial rule”, during which time, Japan spent 20% of its national budget on Korean development (in the early years) and permitted girls to attend school for the first time. The major Japanese companies built factories, branches, and sales outlets on the peninsula, providing substantial employment opportunities as well as consumer goods. The Japanese built the first major utilities there as well. In the late 1920s, the largest power company was 100% Japanese-owned, but by 1940 was 9% Korean-owned. That Korean ownership stake was taken by large financial institutions, which also didn’t exist until the Japanese got there. By all estimates, population on the peninsula was falling prior to 1910, but it doubled over the next 35 years of misery and torture. In short, scrape away all the delicious emotionalism, and you’ll find that those are the memories which are really the bitter ones. The people who wish to enter the Japanese diplomatic service and serve in Northeast Asian countries don’t have to go to all that trouble to attend the Foreign Service Training Institute. That would be a waste of time and resources. The training received by summer playground counselors should be more than enough. If I were a Japanese foreign service officer, I think a posting to the Siamese Ghetto would be more fun. * (We in) Japan should repudiate the Constitution and immediately create a new one ourselves. * The Constitution was written in three or four days by the Americans and consists entirely of hideous text that was translated from the English to the Japanese. * It has been the valid law that governs the country, even after Japan regained its independence with the San Francisco Peace Treaty. Nowhere else is to be found an example of idiocy such as this. * (The Constitution) has created an extremely distorted mentality among the people, who have a strong awareness of their rights, but no awareness of their responsibilities. – Tokyo Metro District Gov. Ishihara Shintaro in a speech to the Heritage Foundation in the United States on the 16th. 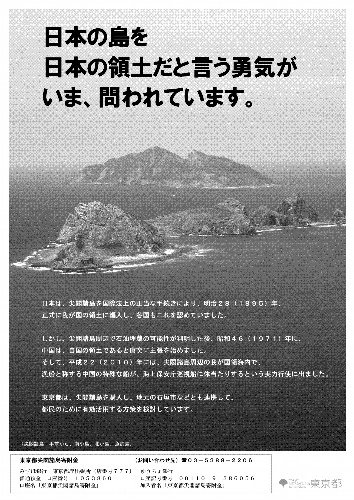 The coverage of the speech in English focused entirely on his mention of the intent to purchase some of the Senkaku islets from the family that owns them. None of them mentioned his discussion of the Constitution. All the major overseas news outlets did find the space to mention that the Heritage Foundation is a “conservative” think tank, though those same outlets never find the space for an adjective when the think tank is left of center. 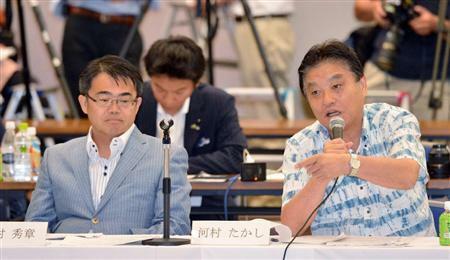 THERE’S been a slight change of plans: The next phase in the series on Osaka Mayor Hashimoto Toru was to move on to the controversies that have erupted over his behavior and theories of government administration in Osaka. After last week’s episodes in the daily Hashimoto docu-drama, however, there’ll be a quick detour before getting to the red meat. Episode #1 featured Mohammad in the form of Tokyo Metro District governor and national curmudgeon-in-chief Ishihara Shintaro traveling to Osaka to visit Mt. Hashimoto for a private discussion that lasted about 90 minutes. Both men were mum on the details of the confab’s contents. That the Tokyo governor, 38 years older, in his fourth term, and a celebrity for more than half a century, would be the one to travel is noteworthy in itself. Most of the news media is still in the breathless schoolgirl diary phase with Mr. Hashimoto, so speculation over a possible political alliance spun their little hamster wheels even more furiously. Mr. Ishihara, who has been complimentary of the Osaka mayor, is in the process of forming a new political party with his curmudgeons-in-arms. Mr. Hashimoto has demonstrated sound political instincts to this point, and he certainly knows the polls show the public takes a dim view of the new old guys’ party by a two-to-one margin. That’s the reverse of the two-to-one margin that looks forward to the contribution of regional parties such as the one he leads. Other than budgets, most politicos are clever at basic arithmetic, so if there are any positives to an alliance outweighing the negatives, they’re not easy to see. One the other hand, Your Party head Watanabe Yoshimi took a more relaxed view, suggesting that the two men were just getting a sense for each other. There were some minor revelations: Mr. Ishihara told Mr. Hashimoto that national politics is a different game altogether from local politics. (He was elected to the upper house of the Diet in 1968, and after four years there spent 23 years in the lower house.) Thus, one possible benefit of a meeting would be for the older man to explain the birds and the bees of Nagata-cho and national celebrity politics. Episode #2 was much smaller in scale, but much larger in impact. In brief, here’s what happened: The Asahi Shimbun wrote an editorial criticizing Ozawa Ichiro for playing house wrecker again and balking at the DPJ leadership’s insistence on a tax increase. That’s unremarkable in itself; it’s what newspapers do. The Asahi, however, had to get all Asahi-ish about it and criticize Mr. Ozawa for being undemocratic. One of their employees actually wrote the line, “Democracy weeps”. In one of his Tweet-a-Ramas, the Osaka mayor stuck up for Mr. Ozawa while sticking it to the Asahi, which also runs editorials calling on Mr. Hashimoto to reconsider his positions. The mayor pointed out that the DPJ leadership’s decision to back a tax increase had nothing to do with democracy, yet his own clearly stated positions won a large electoral mandate in November. He wondered if the Asahi had any idea what they were talking about. The defense of Mr. Ozawa prompted university professor, author, and blogger Ikeda Nobuo to sound off. Here’s what he said in English. During the next general election, everyone’s eyes will be in the movements of One Osaka rather than those of the Democratic Party or the Liberal Democrats. Ozawa Ichiro has praised Hashimoto Toru as a “comrade in the reform of the governing structure.” Mr. Hashimoto also thinks the consumption tax should be converted to a local tax. In exchange, the regions would eliminate the tax fund allocations from the national government. The insufficient funding sources for local government would be offset by local governments raising the consumption tax on their own responsibility. In addition, project-specific tax revenues, such as those for roads, would be transferred to the regions in addition with the work. He praises “Ozawa Sensei” for supporting these changes in the governing structure. One can sense Mr. Hashimoto’s intent in using sensei, a term of respect, for Mr. Ozawa, which he uses for no other politician. This is a misapprehension of reality, however. During the election for DPJ party president in 2010, Mr. Ozawa called for incorporating all the subsidies to local government in a lump sum. He said nothing about eliminating the tax grants to local governments and replacing it with the consumption tax. If the consumption tax were to be converted to a local tax and each prefecture had different tax rates and category exemptions, there would be great confusion. What consumption tax would be levied for companies with branches throughout the nation? Some of the American states have a consumption tax, and there are different VAT rates for each European country, which creates the problem of tax avoidance. If this plan to have different areas in small Japan levy different taxes is not a joke, I can only think it is ignorant. Mr. Hashimoto has said, “I am not completely opposed to a consumption tax increase, but I am opposed now to a tax increase for the purpose of social welfare expenditures.” Is he unaware that during the Hosokawa administration, Mr. Ozawa proposed raising the consumption tax to 7% and converting it to a national social welfare tax? This incoherence results from making the decision to defend “Ozawa Sensei” first and then looking for a reason to oppose the consumption tax which conforms to that decision. As might be expected, even Mr. Hashimoto recognizes that he cannot “completely oppose a tax increase” in Japan’s current fiscal state, but says he is opposed to this tax increase proposal. But if he’s opposed to this proposal, he offers no substitute that spells out when and under which circumstances he would increase taxes. He has no plan specifying how he would rebuild the nation’s finances. Mr. Ozawa was once in the forefront of a move to increase the consumption tax. The reason he opposes that now is clear: He wants to bring down the current anti-Ozawa leadership of the DPJ. That’s what politics is like, and it’s pointless to look for a logical consistency in his assertions. Mr. Hashimoto, who defends this fuzzy logic, has thus become a fomenter of political crises himself. But I do not think this political crisis-focused intuition is bad. If Mr. Ozawa leaves the DPJ and combines his fund raising and organizational skills with Mr. Hashimoto’s popularity, they could become the strongest party in the next general election. 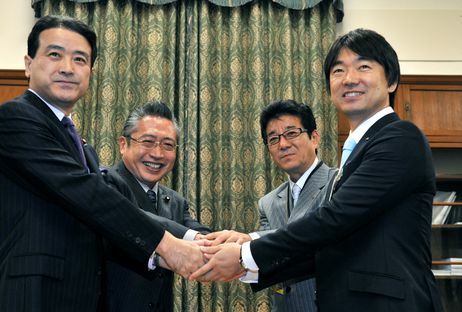 If some of the LDP members join, it could result in a Prime Minister Hashimoto and a party Secretary-General Ozawa, a pattern similar to that of the Hosokawa administration. The problem, however, is what they would do. Mr. Hashimoto’s policies are off-the-cuff populism, such as his labor union bashing and opposition to nuclear energy. If that is to be his approach to national politics, the Kasumigaseki bureaucrats would make short work of him. Mr. Ozawa’s power has also waned, so there would be serious concerns that this government would be as short-lived as the Hosokawa administration. The only thing to do is look forward to the election after next. First, the obvious: If they handed out trophies for being the most unpopular politician in Japan, Ozawa Ichiro would be awarded enough palms to retire to a coconut plantation. His negatives surpass even those of the DPJ itself. If Hashimoto Toru is foolish enough to form an alliance with Mr. Ozawa, the bloom would go off the rose so fast you’d need time-lapse photography to see it. He would almost certainly be written off by Your Party and many of the people who have come to Osaka from elsewhere to work with him. (If they didn’t, they themselves would be written off by the public.) It would also legitimize the charges that he’s a power-mad despot who would adopt any policy to seize that power. It’s never possible to rule out anything with politicians, tending as they do toward venal stupidity (or stupid venality), but a Hashimoto – Ozawa alliance does seem unlikely. For one thing, as Prof. Ikeda notes, Mr. Ozawa’s influence has waned. Regardless of the circumstances, the next election for his acolytes in the Diet will be the equivalent of the Light Brigade charging into the Valley of Death at Balaclava, giving One Osaka fewer allies to work with. * Saying that Mr. Hashimoto’s anti-nuclear power stance reeks of populism is a legitimate charge, even considering that Prof. Ikeda is staunchly pro-nuke. The Osaka mayor hasn’t come up with anything remotely resembling an alternative energy plan, and his anti-nuclear appeals are based entirely on emotion. But denigrating Mr. Hashimoto’s union-bashing (if that’s what it is) as populism is ill-considered word-slinging. We’re talking here about public sector union members, not trade unions. As prefectural and municipal employees whose salaries are paid by the citizens, their behavior and on-the-job conduct is Mr. Hashimoto’s responsibility as the chief executive officer of government. Those salaries have been pegged at 40% greater than those of their private sector counterparts, and the only people anywhere who pretend to think they work as hard or harder are the politicians receiving their support. One of Mr. Hashimoto’s consistent themes is the necessity for public employees to work as hard as private-sector employees with the same sense of urgency. And that doesn’t begin to examine the problems with the dark antimatter of Japan’s teachers’ unions in public schools. But we’ll leave all of that for another day. * Prof. Ikeda thinks small Japan won’t be able to handle different tax rates, but Japan isn’t as small as some Japanese like to think — it’s larger than any European country, unless you count Russia. Mr. Hashimoto also favors a sub-national reorganization of the 47 prefectures into states or provinces, and most of those plans call for nine to 12 entities. Thus, there would be fewer tax differences than the professor suggests. There’s no confusion over applicable tax rates for companies operating in different areas of the United States, and if the Americans can handle it, the Japanese can. The goal is decentralization and the devolution of authority to local governments. Skillful people in the regional areas can use tax policy to their advantage by enticing companies to relocate. For years, some Japanese have lamented the differences in the economic strength of the regions, and local tax policy is one way to change the balance. Successfully attracting companies would result in higher and better employment, and that would result in lower social welfare expenditures. True, inept government management could create situations such as that which exists in California, where usurious taxation, over-regulation, and public sector emoluments are driving legitimate businesses and serious people out of the state. Japanese local government is not immune to that disease. For example, Rokkasho-mura in Aomori used tax subsidies from the national government to build an international school for the children of the employees at a local power plant. The construction costs were JPY 400 million, and annual operating costs are roughly JPY 100 million. That’s a splendid edifice for seven foreign children. But that’s what happens in a free society when people take responsibility for their own affairs — some of them screw up, and they must be held accountable. The paternalist/nanny state alternatives have shown us their inhuman face, and it’s too ugly to contemplate. * The United States has a sales tax, not a consumption tax. There are differences. Parents who send their children to a juku in Japan have to pay consumption tax, for example. American sales taxes don’t apply in those situations. * Finally, Prof. Ikeda seems to have it backwards. Mr. Hashimoto opposed the consumption tax increase before he started looking around for reasons to defend Ozawa Ichiro. Criticize the man if he’s got his numbers wrong — and some say he does — but not for having the idea to begin with. Maybe Hashimoto Toru needs to get his trousers pressed. That’s an excellent rule of thumb, but it’s not applicable this time. Another contributor to Blogos, the large blog aggregator Prof. Ikeda organized, suggests they cool it. He thinks there’s little difference between the positions of the two men apart from nuclear energy policy, and adds that a Hashimoto-Ozawa alliance is unlikely. What’s more likely are alliances such as this: The first election in Osaka Prefecture since last November’s One Osaka victory was held on Sunday for the mayor of Ibaraki. The winner was Kimoto Yasuhiro, backed by both One Osaka — their first endorsement — and Your Party. Perhaps the most pertinent aspect is Prof. Ikeda’s concluding statement that an alliance would force people to wait for the election after next to get what they want. It bears repeating: The public anger is real, it’s been there for years, it’s growing, and Hashimoto Toru is only the most visible personification of it. In the comments, reader Tony wonders if the Osaka mayor is flying too close to the sun. I don’t think that’s happened yet, but if the wax in his wings does melt, others will take his place. As for waiting on an election, we might have a while to go. People are warning that a tax-raising, Ozawa-less DPJ-LDP coalition is not out of the question. This is what the consumption tax is being raised for? The folks at the Seetell website have it right — perhaps the people of Tohoku should apply to international aid agencies if they want relief. Their own government would rather play rich uncle and spend the money somewhere else.